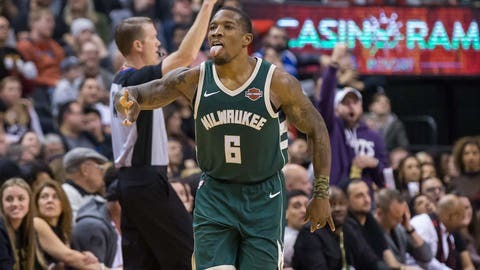 MILWAUKEE — Roughly a quarter of the way through the 2018-19 National Basketball Association season, the Milwaukee Bucks have taken their fans on a bit of a roller-coaster ride. Under new head coach Mike Budenholzer, the Bucks have flourished offensively and enter their Wednesday night matchup with the Chicago Bulls leading the NBA with 121 points per game and at 14-6, own the league’s second-best record while marking the franchise’s best start through 20 games since the 1990-91 season. Giannis Antetokounmpo has led the way. The reigning Eastern Conference Player of the Week fell one assist shy of a triple-double in a Monday night loss at Charlotte but is averaging 30.2 points, 13.8 rebounds, 7.0 assists and 1.8 steals per game while shooting 60.9 percent from the floor over his last five games. All that has been good and kept fans rollicking as the Bucks break in a brand-new arena in Downtown Milwaukee. But they’ve also been maddeningly frustrating at times, too, with a tendency to fall behind big early before spending the rest of the night furiously playing catch-up. That was the case Monday night against the Hornets, who led by as many as 25 in the third quarter then held off a late comeback attempt down the stretch for a 110-107 victory. The loss was Milwaukee’s second in three games and left the Bucks 7-6 since starting the season 7-0. “We’re a talented team, we’ve played really well up to this point, but we’ve just got to be consistent,” point guard Malcolm Brogdon said. Chicago (5-16) has lost three in a row and seven of its last eight after falling 108-107 at home Monday night to San Antonio. Head coach Fred Hoiberg’s squad has been decimated by injuries this season, but help could be on the way soon after second-year center Lauri Markkanen went through a full-contact practice session Tuesday for the first time since injuring his right elbow early in training camp. The hope at the time that was Markkanen — the No. 7 overall pick in the 2017 NBA draft — would miss six to eight weeks. He’s surpassed that by a week and still doesn’t have an official return date in mind but getting him back on the court was good news for Hoiberg. “We’re going day by day,” Markkanen told the Chicago Sun-Times after the team practiced Tuesday. “Today was the first real practice for me. We’ll see how it reacts to that. Hopefully, soon. Markkanen’s injury has opened the door for Jabari Parker to get more playing time. He’s averaging 16.5 points on 45.5 percent shooting with 7.9 rebounds and 2.4 assists in 14 games since Hoiberg moved him into the starting lineup, and 22 points on 52.5 percent shooting over his last four games including a season-high 27 last weekend against Minnesota. Parker scored what was then a season-high 21 points and grabbed eight rebounds earlier this month when the Bulls faced Milwaukee, which drafted Parker No. 2 overall back in 2014. Chicago led by as many as 22 in that contest but the Bucks surged back after halftime and outscored the Bulls 78-41 over the final two quarters for a 123-104 victory — Milwaukee’s third straight against Chicago. A victory Wednesday would give the Bucks their first four-game winning streak over Chicago since they swept the 2000-01 season series en route to the Eastern Conference Finals.